We shall differentiate between two quality concepts, what the consumer perceive and intrinsic product quality. In the first case, quality consumers perceives is influenced by several factors: colour, flavour and aroma valorised depending on their knowledge; but in general he must rely on the intrinsic quality determined according to quality control standards. Endogenous parameters (those defining the features possessed by the spice): this group can be separated in two sub-groups, physico-chemical paramteres as humidity, ashes content, colouring intensity, etc defined by specific evaluation techniques and organoleptic parameters, defined by a sensory analysis. Exogenous parameters (those that are not part of the spice): exogenous parameters controls aim to determine the absence of alterations as well as guaranty that levels of microbiological flora and pesticide residues are below the limits defined by law. For parameters that define intrinsic saffron quality, a spice that lends colour, flavour and aroma, the highest quality would be the most elevated concentration of the substances responsible for conferring these organoleptic properties. But at the same time, intrinsic quality also means the lowest possible content of certain elements such as floral remains, dirt, insects, human hair, microbiological contamination, whose presence must be found under the maximums established by various legislations through several techniques as TLC, HPLC and sensorial analysis. This section groups different critical points during cultivation, subsequent transformation and storage that bear an influence on final spice quality. 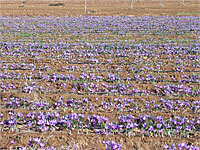 Cropping conditions: the extreme drought which sometimes occurs in regions where saffron is cultivated reduces its quality. In this case quality is understood as the size of the filament, since the small flowers produce small stigmas. The international market demands the longest possible stigma ending in a large, conspicuous festoon. There are some parameters as water, effect soil, fertilization and temperature which have a direct influence on saffron quality. Flower harvesting and stripping: it is necesary to harvest the flowers as soon as possible in the morning when they are closed yet. Stigmas are better protected during transportation when the flower is closed. However, flowers that have remained open all day are partially withered and more difficult to strip. Good stripping means that the stigma is cut at the proper place, neither too high so that its filaments would be separated, nor too low since that would involve less colouring strength due to an excess of the style. Saffron stigmas dehydration: without a doubt, this is the process with the greastest influence on saffron quality. Handling, storing and packaging: all the processes that saffron undergoes after dehydration pursue three well-defined aims: the product must reach the consumer without losing any of its intrinsic qualities, such as colour, flavour and aroma. Possible alterations of the product through the action of chemical, physical or biological agents during storage must be avoided.